Another fascinating collection of Maier photos well worth waiting for after Maloof's 'Street photographer' from 2011. This selection is from Jeffrey Goldstein's collection of about sixteen thousand negatives , 225 rolls of film and fifteen hundred color slides (so expect more books and I'm especially interested in how she handled color). The nine chapters have photos from 1949 to the mid-seventies and so they are a good sampling of the things that caught Maier's eye. The three chapters that I thought worked the best are: 'America' with forty-seven photos of Los Angeles and New York; 'Maxwell' has twenty photos of this Chicago street market; 'Downtown' with thirty-four taken around the Chicago Loop area. These are photos of Maier at her best, capturing the bustle of big city streets with energy and compassion. 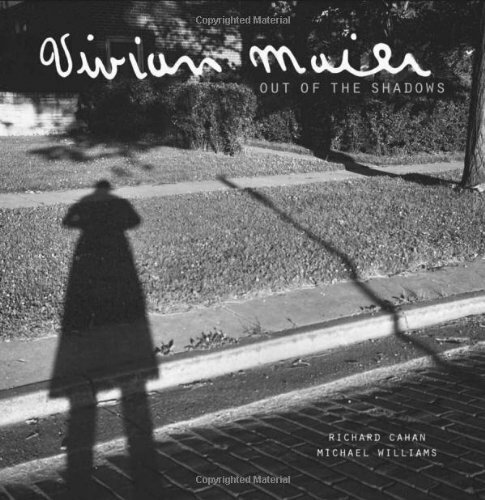 One thing missing from Maloof's book was explanation of who was Vivian Maier. `Out of the shadows' fortunately fills in a lot of detail about her life and interest in photography and each chapter gets a short essay about the photos that follow. It is inevitable that this book is compared to Maloof's and like another reviewer I prefer his book. It has a much better selection of photos and nearly everyone shows one of Maier's strengths: her ability to create perfect framing. 'Out of the shadows' has many more photos but because of this I thought it also included several that seemed, perhaps, not worth including. The child asleep in a car, page 123, street light on page172, some lit windows floating on a black square, page 277 (it could well be that authors introduced some non-specific photos to create a change of pace as the reader turns the pages, the 'Street photographer' book used several blank pages to do this). Maloof's book is also a better production with a good matt art paper for the 200 screen printing which produces solid blacks and mid-tones, something I thought was missing from 'Out of the shadows' though printed with a 175 screen. Both Maier books, of course, display wonderful photos taken by this extraordinary amateur photographer. Who knew while she was alive? Her legacy will slowly be revealed with each new publication. A spread from the book's Intro. A spread from the 'Snapshot' section. Right: a terrific shot to illustrated why Maier's street scene work is so important. Left: one of the also-rans in the book. John Maloof's book had very few. Unusual beach scenes with shadows but no white sky.